Do we have a problem in the digital industry with a lack of female talent? Personally, I don’t believe there’s a shortage of talent, but I do believe that there’s an inherent lack of will to celebrate that talent. Of course, the digital industry is far from alone in this: Lana Del Rey’s ‘F*d my way to the top’ comments on the music industry (you can believe she did or accept that she is an amazingly talented woman. For the media industry, take a look at the magazine racks next time you go past: on the cover of the woman’s mags you’ll predominantly see women, and on the front cover of the men’s mags, yes, you guessed it, mainly women (albeit usually with slightly less clothes on). And in sport, at ‘the most equal Olympics ever’, London 2012, there was only one sport (equestrian) that offered total equality in ability to compete. Whilst we can’t do much about those industries’ bias, we can – and should – do something about ours. First and foremost, we need to attract great talent into this profession. Bright young things coming out of university are more likely to be drawn to professions where they believe they can succeed. A few of the stronger ones will join up anyway, but since childhood, boys have been given the blue row to walk down, girls have been given the pink one. It takes some guts to walk down the wrong aisle. If women’s contribution isn’t celebrated, putting some ‘pink in the aisle’ we are less likely to bring in that talent. 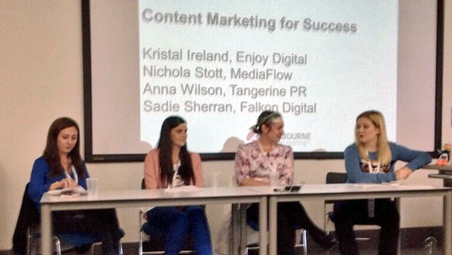 In June this year, a SAScon session on ‘Content Marketing for Success’ featured four hugely talented women. Yet it was the make up of the panel – all female – that earned the comment, not the content itself. If these women were on the panel because they were women, are men on the all male panels there because they are men? I’m going to say something contentious here: conference organisers are lazy. I don’t mean they do nothing – there’s a lot of hard work involved in making a conference run smoothly – but it’s not their job to bring on new talent. It’s their job to entertain an audience. They are always going to pick tried and tested speakers. If those speakers have traditionally been male, the organisers are going to pick from a pool of male speakers. The answer doesn’t necessarily lie with the conference organisers, although perhaps they should be considering that if they are only calling on the male digital population as speakers, their conference is probably only showcasing half the talent and thought leadership that it could be showcasing and they won’t have the best. Part of the answer more obviously lies with us, with our agency heads. Your talent needs showcasing anyway, so why not the female talent? Too often it is women themselves that don’t want to step forwards. Perhaps they’ve seen women verbally attacked or made fun of for their appearance rather than the content of their talks. Perhaps they’re afraid they’ll get it wrong. And, sadly, they are right. There’s a whole bunch of research out there, succinctly summarised in Sheryl Sandbergs ‘Lean In’ as: when men are successful, they are perceived as likeable – the opposite is true for women. Take a look at your female talent. What are their strengths? Are these things that could be shared as a talk. If so, encourage these women to blog for your company, to specialise, become experts in their field, so that they can confidently stand and face an audience having had the space and time to build that confidence. Offer presentation training to your talent, and ensure that the women on your teams say yes. Encourage. Support. Don’t forget that they are subconsciously being judged by audiences on two levels more than their male counterparts – their appearance and their likeability, so their content needs counter this by absolutely rocking that audience. We looked at the unintentional bias, above. But I suspect that there is also a content based issue. Many of the female speakers at SEO conferences are wheeled out to do the ‘fluffy’ PR based subjects, rather than the hard fact based technical presentations. Given an audience of people with a strong technical bias, who is going to score higher? Tthe person offering hard facts and technical tips or the person offering a challenging concept or, as I’ve seen with a number of PR company presentations to SEO/digital audiences, ‘How I got this great piece of coverage’. It’s a challenge, and one I’m still trying to work through personally (people always value what they want far more than what they need), but one we must find some answers to. Conference organisers can and will help – the desire is there, they want the very best content on their podiums. Let’s help them get it. (There’s a great piece on State of Digital giving you the reasons you should participate). How many women are on your board? Companies with women on their boards – diversity at the top – outperform their male dominated counterparts. Sanberg’s Lean in looks at much of this, but in essence ’the pink is already in the aisle’ – women are already valued by this organisation and women are subconsciously empowered to succeed. For agency heads, I can firmly recommend the McKinsey report ‘Why Women Matter’ [PDF]. Is there really a problem here? Personally, I don’t think that excluding men from an event is any better than excluding women, but then I don’t care much about the opinion of misogynists and welcome debate on the merits of the argument. I don’t much care if you like the way I look. It’s not so easy for many other women, particularly those younger than me. But the very fact that so many specific women-driven blogs, networking groups and support groups exist in our industry should be ample indication that there is an issue to address. And for my part, I’ll ‘Lean In’ and support them, because the women who are making it happen are at very least stepping up to the plate, embracing the issue and doing something about it. I challenge all of us to share responsibility for finding solutions, even if it’s just small ones. I’ve walked into a number of agencies where the ladies loos, for example, are rarely cleaned because the agency is mainly men – not very welcoming. I’m always hearing the generic ‘one of the lads’ terms. I’m sure others will come up with a million other examples. Now you’ve read this far (thank you), perhaps your consciousness has been raised. Is there some small thing you can do to redress the balance? And could you share it here? Great article Claire! This is an issue close to my heart as a woman in the industry who speaks, writes and manages. I often think in digital that women can our own worst enemies – instead of “leaning in” and helping each other and being collaborative, some can feel threatened and this can lead to the opposite environment to the one we are trying to create. It’s a tough one. I’ve been on the receiving end many, many times. I’ve been denied a promotion as I was “too young, too blonde and too female” to be taken seriously by the senior stakeholders I’d need to interact with. The first time I spoke at a conference about PPC on a two woman panel, one of the male attendees tweeted something along the lines of, “is it me, or are the female PPC presenters hotter than the SEO ones?” – completely unnecessary when we’re there to try and share our knowledge and expertise. I’m hoping it won’t be long before any and all comments we receive are based solely on the content we’ve shared and the manner in which we have done so. Fixing industry culture is also a huge challenge. I’ve worked in some places where the environment was openly hostile towards women (particularly those with opinions) and others where it really doesn’t feel like it matters who or what you are as long as you’re good at what you do. I think that those of us who are able to step up, into those roles, to do those things and meet those challenges head on should do – I believe we have a responsibility to set an example for women coming into the industry to show what’s possible – while trying to make it a better place for them. Once again, great article and I hope you get lots of feedback! Thanks Arianne, so do I! Thanks, the dearth of women is horrible and everywhere. And whenever I point it out to people they tend to just stare at me. On my own level I have started to question organisers how they even can market events that are not more or less balanced in their panels. Fine I realise that some areas are male dominated, but as you say sometimes they don’t even try. Two rather nice initiatives in this area are: http://rattviseformedlingen.se/equalisters ( you have to scroll to get to the English text) and http://tackanej.se/men-say-thanks/ For me this is the way forward, the idea of affirmative legislation to deal with matters is abhorrent. I admit to not particularly liking Lean In, I got the impression that unless you have a husband and children you don’t count. I understand your reservations about ‘lean in’ the group: it’s a great initiative and I can see why you might feel like that. Reading the book, much of women’s special needs focuses on child are burden. Personally I feel men should be fighting for equality on the child are front – then we may see a far more level playing field. I really enjoyed reading the article. 1) I would say that as a female developer, It’s not that I want to be celebrated more that I want to be treated like an equal. I realise that the road to that involves celebrating women to raise awareness and encourage others, but I feel the goal is still worth mentioning. 2) I think perhaps reminding people to be aware of their unconscious bias when finding speakers could also help too. 3) Exit interviews with women leaving the organisation are a very good way to find out any gender discrimination issues.